These snippets are drawn from an exhibition of village life and history held in 2004. There may have been a school in Peter Tavy as early as 1750, but by 1839 it is known to have been held in a “turf” building alongside Church Cottages. Between the 1900s and the second world war, the school teachers were Miss Milman, who taught the infants in the smaller room of the school, and Mrs. Sleeman who taught the older children in the hall. In the small room, former pupils recall the picture “Jesus knocking on the door – the Light of the World” hanging on the wall. They also remember that during school breaks, girls played on the grass area, boys on the tarmac below. In 1946, senior pupils were transferred to Tavistock, and Peter Tavy became solely a primary school . It seems to have escaped a threat of closure in 1951 but was finally closed in 1959. Concern for the education of children from the outlying farms and hamlets of the parish led to the decision to provide a second school at Hillbridge, located in the little-used chapel of ease there. The school roll reached 62 pupils in 1910, but dropped to less than 10 in the 1920s, so the school was closed. There was a brief reprise when the influx of evacuees during the second world war caused seere overcrowding at Peter Tavy School, and Hillbridge re-opened between 1941 and 1946. One former pupil recalled the evacuees from Birmingham, who were “tough” and ran around – even on tarmac roads – with no shoes and socks on. Life-long Peter Tavy resident James Perkins recalled his school days. He enjoyed his lessons, with about 25 other children, from the coming-up-to-five year-olds, to the 14-years-olds, who then made up two classes. “Many walked a long way to school. I had cousins walk from Moorshop, they came through the snow. Children didn’t know anything different then. They used to mark the register about ten. Mrs. Sleeman was the teacher and she always used to give them another quarter of an hour to see if they were coming because it was a bad walk in the winter. “I liked school – the reading, sums and mental arithmetic. James said the children learnt enough, but not as much as they learned nowadays. Phyllis Dodd recalled two large pictures – one in each room of the school. In the large room it was Holman Hunt’s “Jesus knocking on the door – the Light of the World”, and in the small room it was of Jesus seated on a rock with his arms around children of every race. Miss Mary Milman taught the beginners, and Mrs. Sleeman taught the older ones. The heating was from a large stove in each room. In the large room it was in the centre, so that there was not much warmth at either end when it was cold. Mrs. Sleeman used to stand in front of the fire and pull up her skirt at the back to warm herself. There were two toilets – no more than two buckets which were in the corner of the top yard for the girls, similarly for the boys in the lower yard. A wall separated the girls and boys at play time. Eileen Duncan recalled that Parent Teacher evenings were held on Tuesday nights (in the 1950s), but that as “everyone knew everything that was going on” and the teacher really had little to add, they used to sit and play cards as often as not. The school building was central to village life, used for social gatherings, special events and occasions. The Parish Council met there, during the second world war the Home Guard gathered there. The Peter Tavy Ladies Choir practiced there in preparation for the Tavistock area music competition, which they won in 1927. Concerts, shows and plays were performed – in the 1920s, the Village had a lively dramatic society. It was the venue for popular Peter Tavy dances. James Perkins recalled how people rode in to the dances at the Village Hall, leaving their horses in the barns at Gatehouse Farm (his home) and Higher Churchtown, and changed there into their smart clothes. He remembered how, as a boy, he would lie in bed and hear them returning to collect their horses after the dances. Over 100 people would arrive, to dance the evening away to a band including accordion, piano and drums. When he was old enough to attend, James recalled paying an admission charge of 1s.6d. (7.5p) for the dances – but a cup of tea was extra! After the school closed in 1959, the building became the Village Hall. A great deal of work was required and a committee of management, under the chairmanship of George Mudge raised funds for the work. The Hall continued as a focus for village life, and, although the music and fashions may change, dances and balls are still regularly held, with shows and plays supplied by both local talent and visiting artists – in recent years shows and concerts staged under the “Villages in Action” scheme. Kelly’s Directory of 1850 records two shopkeepers in the village in 1850 – Samuel Date and William Fuge. It is possible that around this time the shops were run on a part-time basis, combined with mining or farming. 1866 directories record John Garland Bray (who had opened the first Post Office) and William Rider as shopkeepers. In 1873 James Ware is recorded as a shopkeeper, and his wife Betsy continued to run a village store until the 1890s. Moyse lived with her daughters Olive and Lily, who kept trading until 1965. At the “Old Post Office”, William Jordan Dodd’s wife Elizabeth sold sweets and groceries, and this shop continued operating until Edith Lane retired in 1965. Bill and Lily Bailey opened a new shop at Jasmine Cottage in the same year. Some villagers remember how their goods were at first displayed over all the furniture – tables, chairs and even the piano! – in the sitting room. Ruth Graham next took the shop on, followed a year or two later by Mr. Gait. Mick and Joan Harvey came next, then the Pollards and Stratfords, and finally Alan and Sylvia Sankey. Like most villages, in the past Peter Tavy has supported and been served by a range of other craftsmen and tradesmen. Carpenters, masons, cobblers, blacksmiths, wheelwrights and coffin makers all carried on their thriving businesses in the village. From 1925, the village has also had a garage, originally built by Bert Cole to house his newly-acquired charabanc. 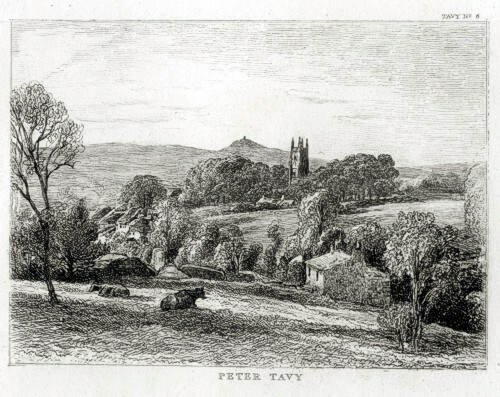 Postal deliveries were reaching Peter Tavy as early as 1637. In 1841, the “Penny post” was introduced, and the volume of mail grew steadily. In 1860 the first Post Office opened in Peter Tavy, run by John Garland Bray at Gatehouse Farm. In 1866, the Post Office transferred to Wisdom, run by Elias Bray, and wall collection boxes were placed at Peter Tavy, Cudlipptown and Willsworthy in 1876 – where they remain in use today. In the 1890s, William Jordan Dodd took over the postal duties, and in 1902 the office was moved to “the Old Post Office”, where there was also a shop selling general goods and sweets. Members of the family continued to run the Post Office until Edith Lane retired in 1965. The Post Office moved to the cottage opposite Wisdom (now known as “Midhurst”) where it was run by Mrs. Weeks. Then it moved next door to “Jasmine Cottage” where a succession of village postmasters followed until the Village Post Office and Shop finally closed in 1994. This was an annual event for many years, and usually seems to have included a concert and a dinner. Sports formed a traditional part of many village celebrations – from the 1897 Golden Jubilee for Queen Victoria to the 2001Golden Jubilee of Queen Elizabeth II, when an energetic and all-encompassing “It’s a Knockout” contest formed the central part of a day of a day of celebration. The local Football Club was clearly an important part of the village in the 1900s. In 1944, and in 1944 Peter Tavy’s team, led by the Reverend Pratt, revelled in their 3-2 victory over a team of Royal Marines. James Perkins recalled that one time, Lawson Dingle wanted to try dog racing. He jacked up his Morris Minor, fixed a wire to the wheel with a “hare” on the end, and ran the car so that the wire was wound around the wheel. It worked perfectly the night before, but on the day the wire jammed half way, and there was a huge dog fight over the hare! This has been a favourite sport in the village for many generations. Peter Tavy won particular renown for beating an Army team in a tug o’ war competition during the second world war.